"Hold on to your seat because you've got a new challenge to meet!" For the first time in over a quarter of a century there was no new Doctor Who on television. The closest we got was an episode of a schools science programme called Search Out Science. This particular episode was called Search Out Space and featured Ace and K9 along with an alien called Cedric taking part in a quiz about space, with the Seventh Doctor asking the questions. With the characters being played by the regular actors and the being programme being aired on 21 November, perhaps this could be classed as the 27th anniversary story. Doctor Who also moved away from the BBC in 1990. A new network of satellite channels was starting up called British Satellite Broadcasting (BSB). 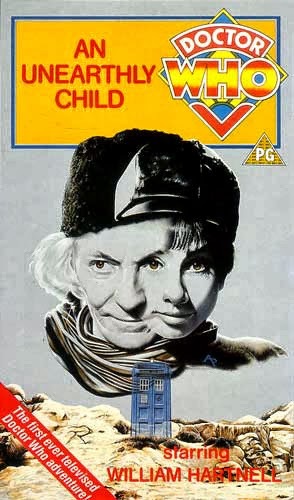 Doctor Who became a regular fixture on the main entertainment channel, Galaxy, with the series being repeated from the beginning. One weekend in September saw the channel host a Doctor Who weekend, with the focus on the first ten years of the series. One of the hosts of the weekend was the most recent producer, John Nathan Turner. Sadly, BSB didn't last long and it was sold to Sky TV. But for a brief while it was the place to go to for fans who were starved of new Doctor Who and needed something to sate their appetites. As well as repeats on satellite TV, there were also plenty of videos to buy. For fans of the first two Doctors this was a bumper year for videos. An Unearthly Child, The Dalek Invasion of Earth, the Web Planet, The Dominators, The Mind Robber and the War Games were all released this year. In addition, Fourth Doctor story 'The Brain of Morbius was re-released. This story had been hacked to pieces when it was first released on video. Now it was fully restored to its original state. 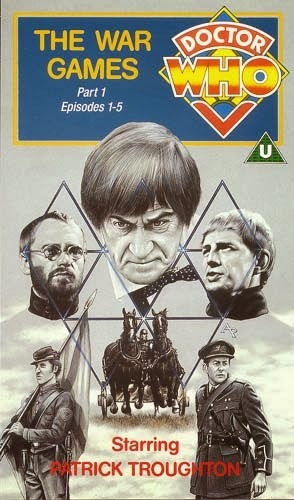 Finally, 'The Five Doctors was also re-released. There had apparently been some small edits on the original release of this video as well and, as with 'Morbius', all edits were restored. Reeltime also continued their seemingly ongoing quest to interview everyone involved with Doctor Who by releasing three further Myth Maker tapes. This time the subjects were the First Romana, Mary Tamm, Cyberleader actor David Banks and the last Producer of the series, John Nathan Turner. Beyond the 'Variations on a Theme' album being released on the relatively new format of CD, the audio releases this year dominated by David Banks. You will recall that, in 1989 he released two tapes of readings from his 'Cybermen' book. In 1990 he released two more. These 'ArcHive' tapes were titled 'The Cyber Nomads' and 'The Ultimate Cybermen' respectively. In addition to these, Banks also released two interview tapes. Again, in 1989, he has released an interview that he'd recorded with Colin Baker. Well, in 1990 he interviewed two other Doctors. Sylvester McCoy was interviewed in 'Who's the Real McCoy?' while Banks talks with Jon Pertwee in 'Pertwee in Person'. Finally, one slightly unusual audio release came free with the December 1990 issue of the Doctor Who Magazine. 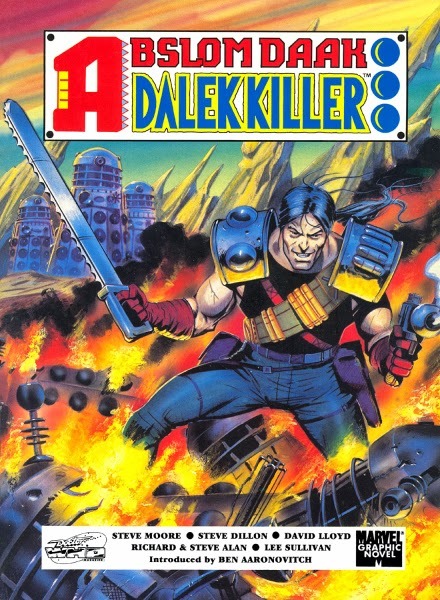 Abslom Daak - Dalek Killer had re-appeared in the pages of the Doctor Who Magazine comic strip in late 1989. His return had obviously sparked a mini-resurgence of interest in the character, as you'll see further down this post. One of the results of this sudden popularity was the recording of a theme tune for the character by a group called The Slaves of Kane. The record, in flexi-disc format was given away with the magazine. Sadly, I've never heard it so I can't vouch for its quality. 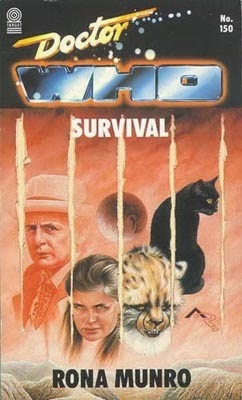 The Target novelisations were beginning to wind down by 1990, not surprising given that nearly all stories had been novelised and that the TV series was no longer on air. Perhaps also not surprisingly most of the novelisations released this year were Seventh Doctor stories. The Happiness Patrol, Ghost Light, Remembrance of the Daleks, Survival and the Curse of Fenric were all released this year to great acclaim. Unlike the majority of the novelisations, these books were not just straight adaptions of the TV scripts into prose form. These three books read more like novels in their own right, greatly expanding upon what was seen on TV. 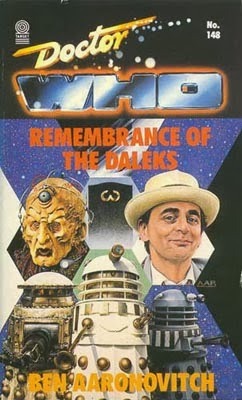 For instance there are several passages in the 'Remembrance of the Daleks' novelisation that take us inside the mind of the Special Weapons Dalek. Perhaps fittingly the man who had written some of the earliest novelisations and had written more than anyone else also wrote some of the last. 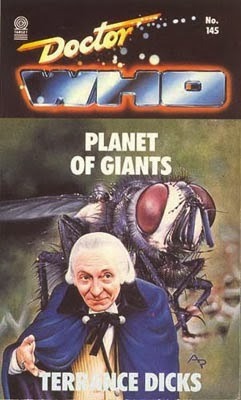 Yes, Terrance Dicks was back with novelisations of two early stories 'Planet of Giants' for the First Doctor and 'The Space Pirates' for the Second Doctor. Target also released the third, and ultimately final, of the Missing Stories for the Sixth Doctor. This story was called Mission to Magnus written by Phillip Martin. Had it ever been made for TV we'd have seen the green slug-like Sil teaming up with the Ice Warriors to take on the Sixth Doctor and Peri. Beyond this, there wasn't much else in the way of new Doctor Who books, although Target did begin reprinting some of the earlier Doctor Who novelisations with brand new cover designs. We did see the belated release of the third part of the Encyclopedia of the Worlds of Doctor Who. The book covered the letters L to R but, unfortunately, poor sales meant that we never did get to see letter S to Z. Finally, Abslom Daak (yes, him again) was given the graphic novel treatment by Marvel UK. There was no new comic strip material in the book, although there was a short story. This book reprinted all of his previous comic strip appearances from DWM. 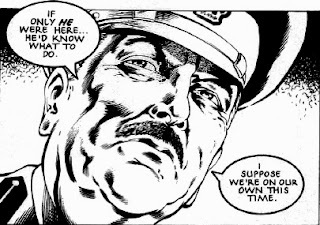 In 1990 the Doctor Who Magazine comic strip was the only source of new stories. That being said, the year began with 'Hunger from the Ends of Time' which was a story that had previously been printed in 'The Incredible Hulk Presents' the previous year. The story saw the Doctor travel to the library world of Catalog where the planet's collection of books was scattered throughout time in order to save on space. The story also reintroduces the futuristic UNIT type organisation, the Foreign Hazard Duty (FHD) group that first appeared the previous year 'Echoes of the Mogor'. The next story was called 'Train-Flight' and featured a special guest appearance by Sarah Jane Smith. By this point in time Sarah had long-since established herself as the most popular companion in the series' history. So it's no real surprise that she should be reunited with the Doctor, albeit in comic strip form. We'd have to wait another sixteen years for her to appear again on television. Speaking of her televised return, that episode 'School Reunion' does seem to contradict 'Time-Flight' somewhat as Sarah seems fair less angry and bitter at the Doctor for abandoning her in the comic strip then she does in 'School Reunion'. Plus, of course, in 'School Reunion' both the Doctor and Sarah claim not to have met up since she left the Fourth Doctor in 'The Hand of Fear'. 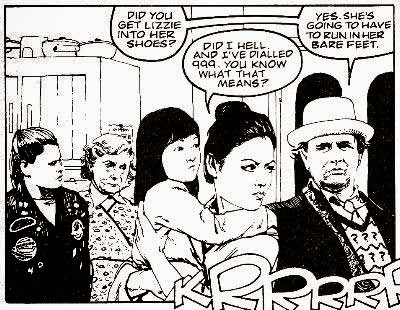 Still, stories contradicting each other is hardly a new thing in Doctor Who and it doesn't take away from the fact that it's nice to see Sarah and the Seventh Doctor teaming up here. Following 'Train-Flight' was 'Doctor Conkerer', a strip that was originally intended for 'The Incredible Hulk Presents', had it not been cancelled. It featured the Doctor playing conkers against a group of Viking invaders in medieval Britain. Then there was another one issue break for the comic strip as it was replaced with a text story called 'Teenage Kicks', written by Paul Cornell and featuring Ace alongside the Doctor. The comic strip was back in the next issue with 'Fellow Travellers'. This three-part story was written by the most recent script editor on the TV series, Andrew Cartmel and was also Ace's debut in the comic strip. The story sees the Doctor and Ace dealing with a pair of creatures called 'Hitchers' that possess people and animals with high levels of rage and hatred. Following this story came two shorter than usual strips which were preludes to the next big story: 'The Mark of Mandragora'. You may recall that the Fourth Doctor story 'The Masque of Mandragora' introduced the Mandragora Helix, an evil sentient form of energy that tried to take over the Earth. 'The Mark of Mandragora' was to be a sequel to that story. The first of the preludes to this story features a guest appearance by the Brigadier, while the second sees the Doctor and Ace discovering that part of the Mandragora Helix is inside the TARDIS, years after the Doctor thought he had originally defeated it. The story proper started in the final issue of 1990 but ran on well into 1991 so I'll look at it in more detail then.